Just before the start of the 16th National Numismatics Congress, Coin Hoards and Finds: protection, study and musealization, I published an article in which I explained what goes into the preparations for a congress and I ended with a confident “At last, everything is ready! And rather like in showbusiness, when the day of the congress arrives, let the Congress begin! We hope to see you there …”. Now I shall make an appraisal of the Numismatic Cabinet of Catalonia’s main project in 2018. National Numismatics Congresses, backed by the Iberoamerican Society for Numismatic Studies (SIAEN), are based around a theme and designed as a forum in which the speeches that the scientific committee has prepared in order to structure the gathering converge with the proposals for papers and posters presented by numismatists on their own initiative, duly assessed and approved by the committee. This task materialized very positively with 5 speeches and talks and 63 papers and 5 posters accepted by the organization, and the attendance of 125 delegates. Delegates attended from the majority of the Spanish autonomous communities, and it must be pointed out that although it is a Spanish event, people from Argentina and the United Kingdom also took part. The quantitative result has fulfilled the most optimistic forecasts and it attests to the notable acceptance of these large periodic get-togethers. The young age of some of the delegates was also tangible proof of continuing interest in the discipline and of the future sustainability of these scientific gatherings. If we look at the statistics by sectors of participation we see a large number of university professors, museum technical staff, researchers associated with different societies, technical and research personnel of various bodies, professionals from numismatic companies and independent researchers and archaeologists. The delegates, duly accredited, received the welcome bag produced by a social inclusion company in which they found the book of summaries and other work materials, plus the gift of some some of the museum’s numismatic publications, information leaflets, and a small box of biscuits inspired on Barcelona croats prepared expressly for the occasion by the staff of the Museum of Chocolate in Barcelona. It goes without saying that everyone found them delicious. After the museum director welcomed the delegates, Marta Campo, the president of the SIAEN, thanked the museum for its hospitality and on behalf of the association she presented Sra. Eulàlia Ausió i Farrés, who with her generous sponsorship made it possible to hold the Congress, with a silver commemorative plaque. And then we got down to business. The scientific sessions presented an updated and diachronic view, from Antiquity to the contemporary age, of coin hoards and finds, such a classic theme of numismatics. The objective was developed from an inaugural speech given by Pere Pau Ripollès, three talks arranged in chronological order – Paquita Chaves (antiquity), Félix Retamero (Middle Ages) and Carmen Marcos and Paloma Otero (modern and contemporary ages), and a closing speech by Albert Estrada-Rius. The papers were grouped together according to subject and chronology. The last session was for papers on a free subject. The general conclusion was a bird’s eye view of the current state of affairs and the main challenges that the discipline faces in this sector. The creation of large platforms available to researchers was considered on which numismatic institutions could place collections. The protection of the numismatic heritage in territorial or international waters with very different national actors and interests. And the huge amount of work involved in the cataloguing and study of hoards, like the one recovered recently in El Zaudín (Seville). 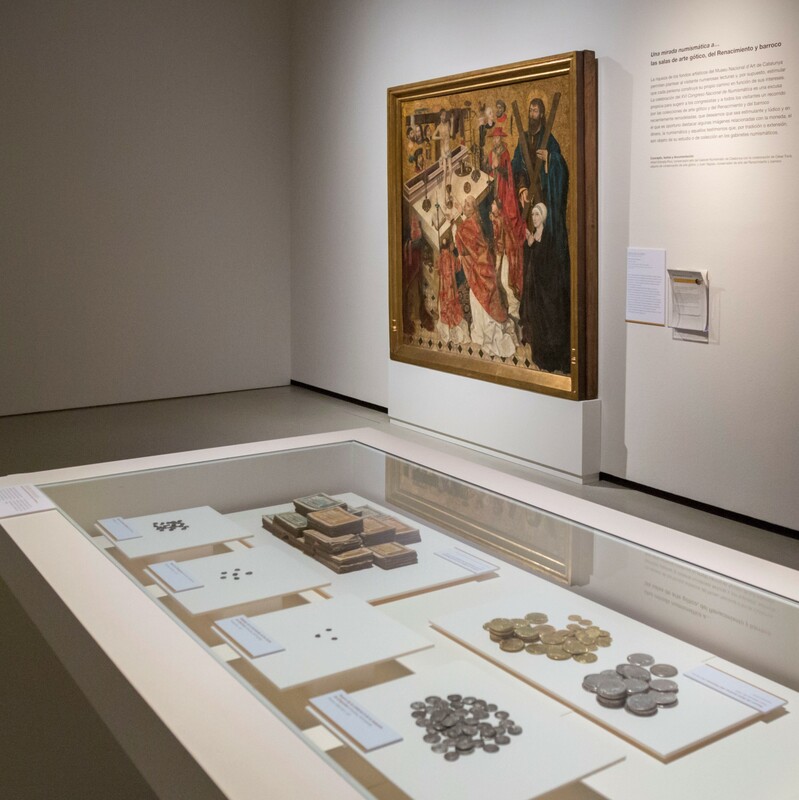 El Numismatic Cabinet of Catalonia had prepared some events connected to the collections for the purpose of structuring the interaction between the delegates and the Museum. They highlighted its own collections and were designed to have an impact beyond the Congress. 1) In three vitrines at the entrance to the Joaquim Folch i Torres Library a display of the old Ausió medals factory was presented, which can be visited until April in situ. The intention was to focus on Barcelona’s past as a medal-producing centre through the collections of this company, active between c. 1900 and 1970, and whose descendants, moreover, sponsored the Congress. This company struck the medals commemorating the Barcelona International Exposition of 1929 on which the Palau Nacional is shown. It was not the only intervention to do with medals. The holding of the Congress also coincided with the installation of a vitrine dedicated to Renaissance and Baroque medals in the rooms of the same name. It was therefore an opportunity to present this collection and the recent refurbishment to a specialist public. 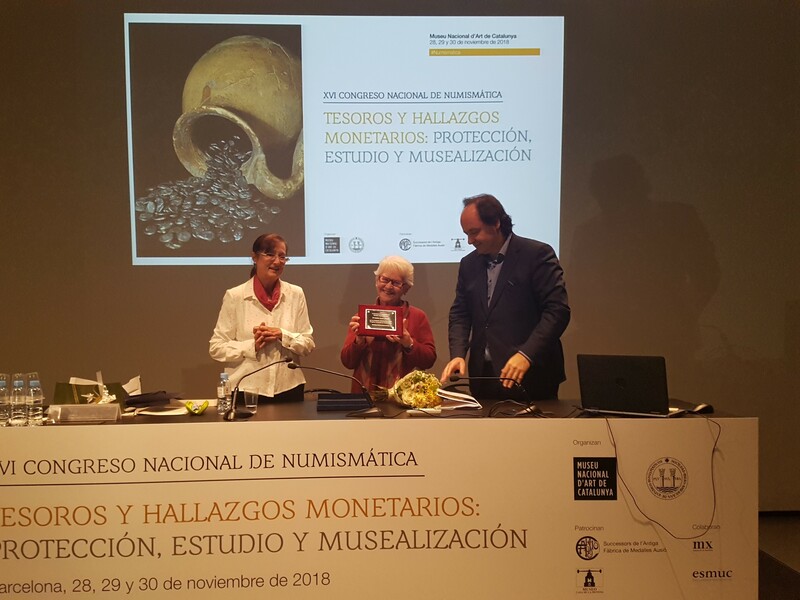 2) The itinerary “A numismatic look … at the Gothic, Renaissance and Baroque collections” was proposed to discover and comment on some works in the collection, aspects that are important numismatically. 3) Finally, the series of numismatic coin hoards and finds conserved by the GNC was highlighted, in both the permanent numismatics room and in the storeroom. 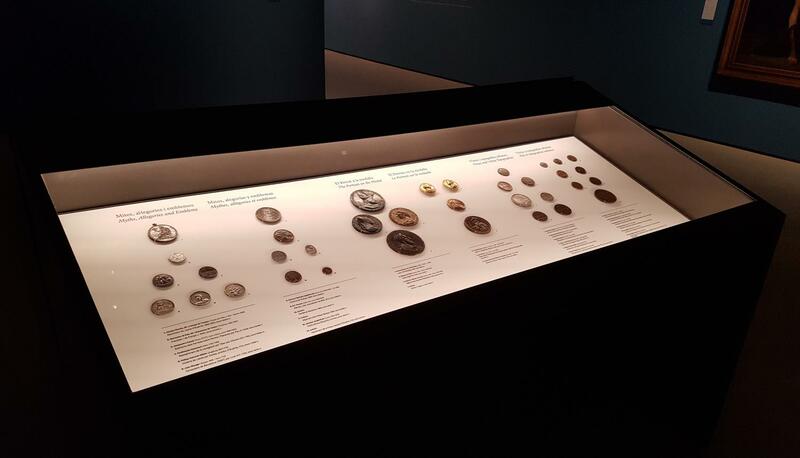 The hoards usually kept in reserve and therefore not on view were exhibited in a vitrine in the room next to the one where the Congress sessions were held, and those exhibited in the permanent numismatics room, which can usually be visited, were pointed out. During a congress there is also time to enjoy the coffee breaks, the meals among colleagues and the receptions offered by the hosts. 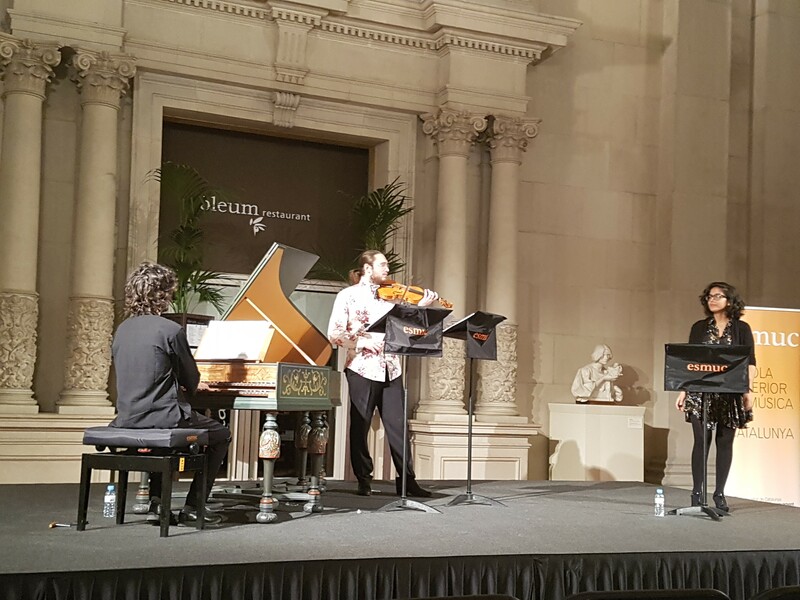 We should mention, in this more light-hearted sense, the magnificent Baroque repertoire of the concertino offered by the musical ensemble Memento Vivere of the Catalan College of Music in the Dome Hall in the Palau Nacional. An excellent soprano accompanied by two virtuosos of the harpsichord and the violin and the welcome cocktail that the Museum offered the delegates afterwards in the same room made a perfect end to the first session. 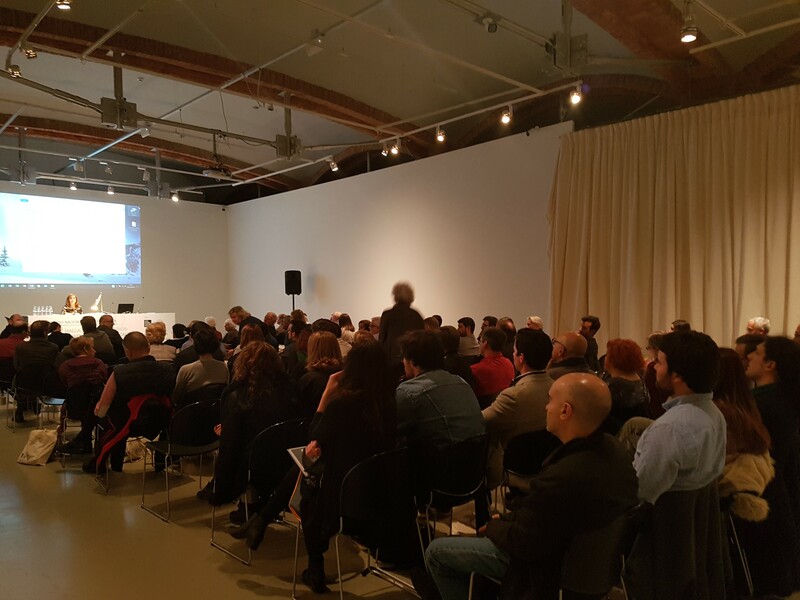 The second day of the Congress ended, on the other hand, in the nearby Museu d’Arqueologia de Catalunya (MAC) whose director welcomed the delegates and offered them the exhibition of a Castilian silver coin hoard found in the sea near the beach in Sitges, which had been prepared specially for the congress. After visiting the display and being presented with the guidebook and other MAC publications the second session ended with a glass of cava courtesy of the MAC. The congress was a relaxed get-together for exchanging ideas and knowledge and a place to make connections and agree on new projects and alliances – a forum of science and coexistence, a cultural event that is a milestone in the personal and professional careers of those attending, also in the future of the discipline. Through the Museu Nacional d’Art de Catalunya, Barcelona is now part of the history of national numismatics congresses.